ingaporean startups in Silicon Valley will soon get a leg-up, if a plan by a group of entrepreneurs and high-tech investors there to start a business incubator bears fruit. Conceptualised by high-tech business consultant Jek Kian Jin, Internet investor David Lim and several other Singaporeans in the Valley, the "grassroots-run" incubator will provide much-needed hand-holding, and even initial funding, for startups there. The project already has moral support from the National Science and Computer Board, which is evaluating a proposal to fund the project. Other Asian venture capitalists and angel investors may also be roped in for funding. 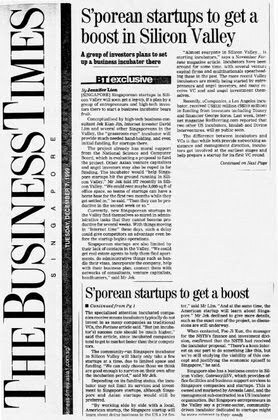 The incubator would "help Singapore startups hit the ground running in Silicon Valley," Mr Jek told BT recently in Silicon Valley. "We could rent maybe 3,000 sq ft of office space, so teams of startups can have a home base for the first two months while they get settled in," he said. "Then they can be productive in the second week or so." Currently, new Singaporean startups in the Valley find themselves so mired in administrative tasks that they cannot become productive for several weeks. With things moving in "Internet time" these days, such a delay could give competitors an advantage even before the startup begins operations. Singaporean startups are also limited by their lack of contacts in the Valley. "We could get real estate agents to help them find apartments, do administrative things such as handle their visas, incorporate the company, help with their business plan, connect them with networks of consultants, venture capitalists, headhunters," said Mr Jek. "Almost everyone in Silicon Valley ... is starting incubators," says a November Fortune magazine article. Incubators have been around for some time, with several venture capital firms and multinationals spearheading these in the past. The more recent Valley incubators are mostly being started by entrepreneurs and angel investors, and many receive VC and and angel investment themselves. Recently, eCompanies, a Los Angeles incubator, received US$130 million (S$219 million) in funding from investors including Disney and financier George Soros. Last week, Internet magazine Redherring.com reported that two other US incubators, Idealab and Divine Interventures, will go public soon. The difference between incubators and VCs is that while both provide networking assistance and management direction, incubators get involved at the earliest stages and help prepare a startup for its first VC round. The specialised attention incubated companies receive means incubators typically do not invest in as many companies as traditional VCs, the Fortune article said. "But (an incubator's) success rate should be much higher," said the article, since incubated companies tend to get to market faster than their competitors. The community-run Singapore incubator in Silicon Valley will likely only take a few startups at a time, due to limited space and funding. "We can only choose those we think are good enough to survive on their own after the incubation period," said Mr Jek. Depending on its funding status, the incubator may not limit its services and investment to Singapore startups, although Singapore and Asian startups would still be preferred. "By working side by side with a local, American startup, the Singapore startup will learn about doing business in the US a lot faster," said Mr Lim. "And at the same time, the American startup will learn about Singapore." Mr Jek declined to give more details, such as the exact cost of the project, as discussions are still underway. When contacted, Foo Ji Xun, the manager for the NSTB's finance and investment division, confirmed that the NSTB had received the incubator proposal. "There's a keen interest on our part to do something like this, but we're still studying the viability of this concept and justifying the economic spinoff to Singapore," he said. Singapore also has a business centre in Silicon Valley, Gateway@SV, which provides office facilities and business support services to Singapore companies and startups. This is owned and marketed by Arcasia Land, and the management sub-contracted to a US incubator organisation. But Singapore entrepreneurs in the Valley say a private-sector, community-driven incubator dedicated to startups might be more relevant to their needs.